Having declared the JSU finished, I was looking at what to do next. I would of course like to finish some of the kits I already have on the workbench, but at the same time I couldn’t help not to pull out something from my stash to start. 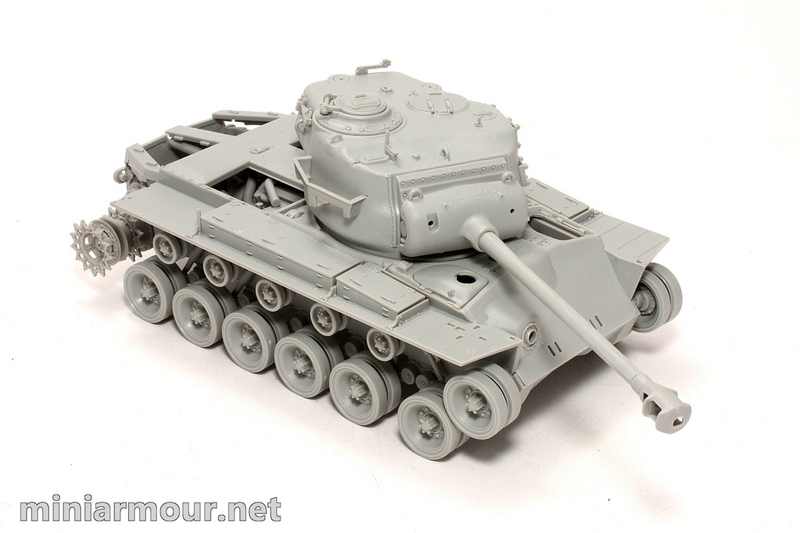 After some consideration I decided for M26 Pershing from Hobby Boss. 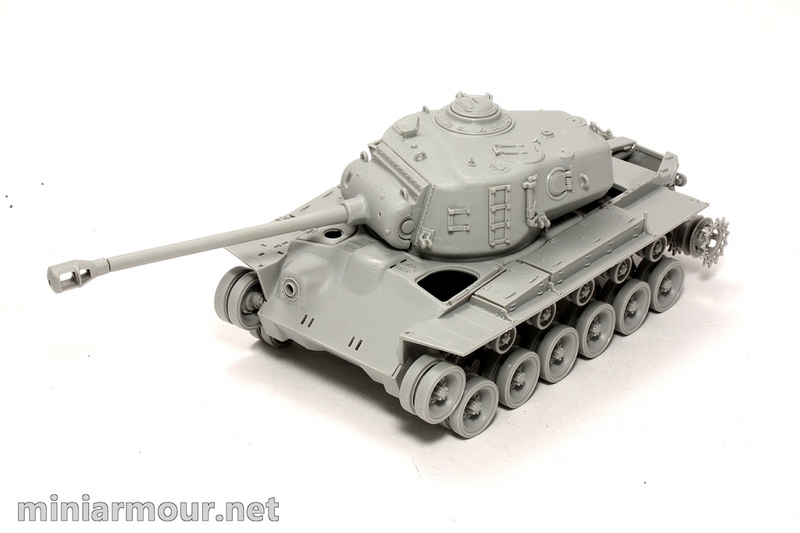 For some reason I like the shape of this vehicle, it blends the WWII design as Pershing still has some features taken from the Sherman and at the same time you can see the transition to post-war tank models showing. Pershing saw some service toward the end of WWII, but I have decided to build the version from the Korean War. 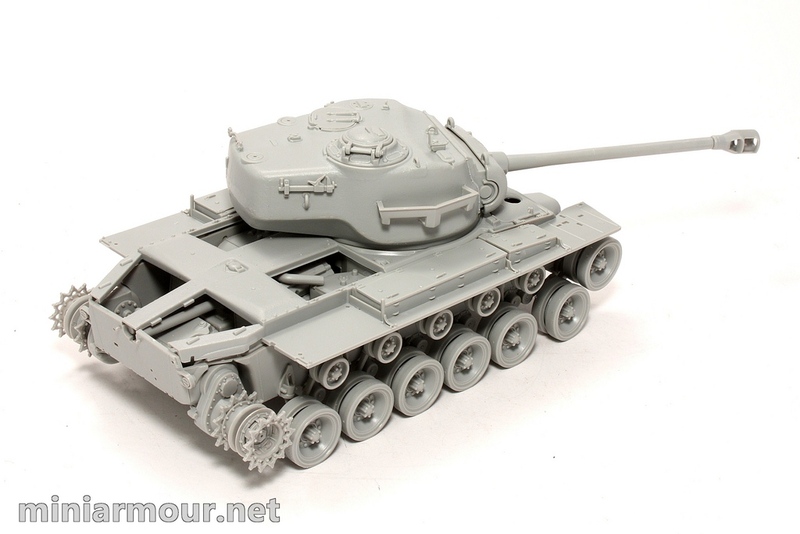 Pershing was deployed in the Korean war after it has been discovered that M24 Chaffee was no match for the Korean T34/85s.The first M26s deployed were scavenged from the depots in Japan and later more were shipped from the US. Toward the latter phases of the war M26 proved to be underpowered (it had the same engine as the M4A3, but weighed 18 tons more) and were slowly replaced with M46 Pattons. 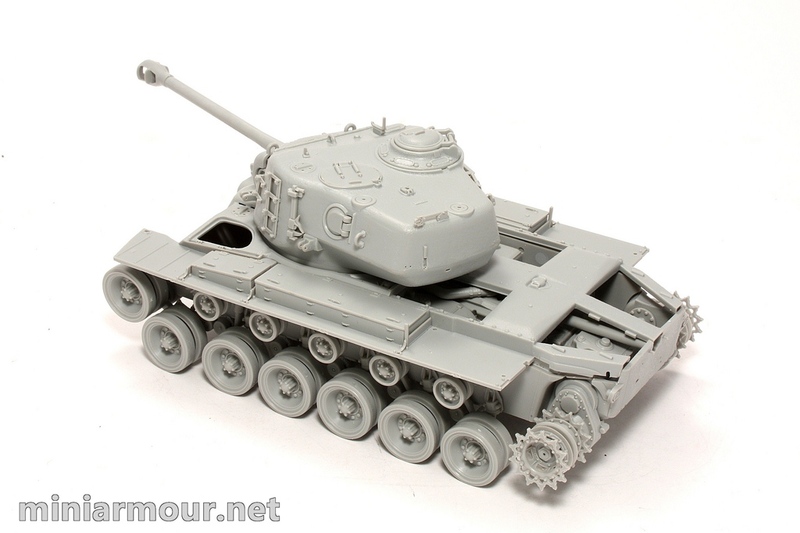 The kit from Hobby Boss is the most recent Pershing and having checked the sprues it looked very nicely molded and detailed. Hobby Boss also included parts to build engine and engine bay and having read positive opinion about it online, I decided to give it a try and build it with the engine hatches open. The kit goes together very well, fit of the parts is good with only small gaps to be filled in some places. Because of the inclusion of the engine, I will have to first build and paint this part and only then I will be able to join the upper and lower hull and finish the construction. At this time I have built most of what can be built without having the two hull parts together. I like the turret, it has a lot of surface details, which I belive will stand out when painted. I am thinking about replacing the barrel as the plastic one is made of two halves, which when put together look OK, but the joint is still visible. Also the join with the muzzle brake is less than perfect, so investing about $12 for RB barrel is not that difficult decision. I will still have to decide about tracks, there were rubber tracks provided in the kit, which are mostly fine, except that they are missing the holes on the outer parts of the tracks, which are quite prominent. I also have AFV’s workable tracks, but because of their complexity I am fearing the construction.